There have always been dangerous topics – ideas and points-of-view that can get you in trouble with the authorities or with other people. In every society it’s important to know the rules about what you can say to who. But it’s hard to believe that those topics used to include the sun, planets and stars. How could it be dangerous to talk about the sky? Nicholaus Copernicus could have answered that. He was a Polish cleric, mathematician and astronomer who was born on this day, 19 February, in 1473. And he supported a dangerous idea: heliocentrism. That’s the fancy word for the theory that the earth goes around the sun, rather than the other way around. Heliocentrism was a dangerous idea because the churches opposed it. Everyday experience tells us that the earth stands still and that the sun moves around it, rising in the east, setting in the west. Science now teaches us otherwise, but for a long time astronomers agreed with everyday experience: the earth is still, the sun moves. Copernicus was born into a geocentric universe, or one that had the earth at its centre. This is certainly what the Bible seems to teach: the Old Testament talks about a miracle in which “the sun stood still” for “a whole day”. How could that be a miracle unless the sun is usually moving? That was how educated people reasoned hundreds of years ago, so Copernicus was cautious about promoting his heliocentric, or sun-centred, theory. His book discussing the theory, On the Revolution of the Celestial Spheres, wasn’t published until the year of his death in 1543. He wanted to be safely underground if his ideas caused trouble. But his theory had been publicized and discussed a long time before that. And it did get someone else in trouble: the great Italian scientist Galileo would later be put on trial and placed under house arrest for supporting a stationary sun and moving earth. He was a more fiery and abrasive character than Copernicus, and he didn’t have an official position in the church. Copernicus wasn’t the first astronomer to suggest that the earth went around the sun, because the Greek astronomer Aristarchus of Samos had done that more than 2000 years ago. But most astronomers had always supported common sense: the earth is still, the sun is moving. The problem is that geocentrism makes calculating the movement of the planets difficult. If they move in perfect circles, which all astronomers then believed, why do they sometimes seem to move backwards against the stars? To make the geocentric theory fit what actually happened in the sky, astronomers had to make their models more and more complicated, adding circles onto circles. 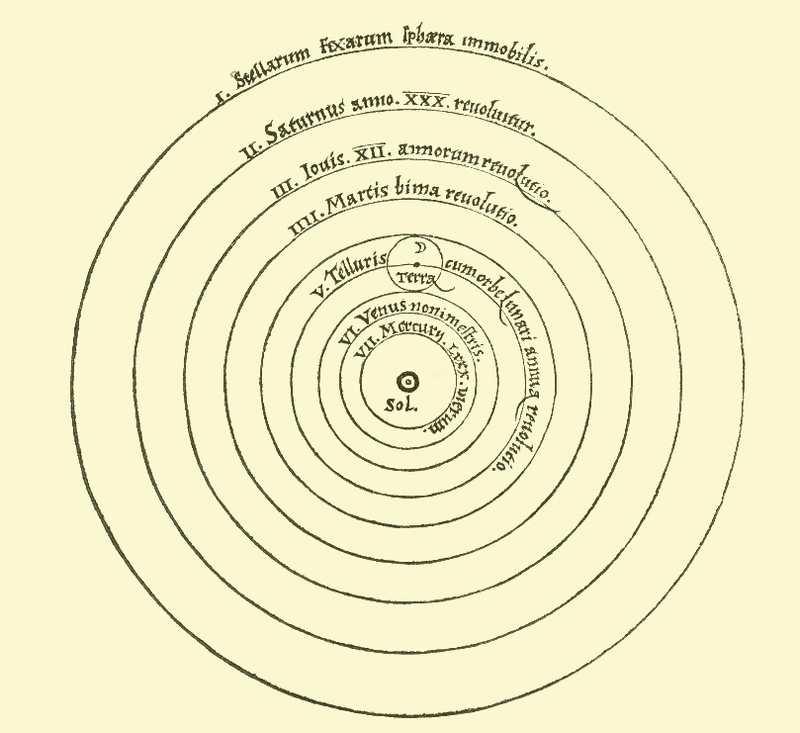 Copernicus too believed that the planets moved in perfect circles, so his theory too had its complications, but it was still a great advance on the old system. It was also a very important step in the creation of modern science and of the modern world. Before Copernicus, the earth seemed the most important place in the universe. After all, it was at the centre. It was the point around which everything else revolved. After Copernicus, when his ideas had become widely accepted, all that changed. The earth was not at the heart of the universe any more. It had lost its literally central place in the scheme of things. The Copernican revolution, as it is now widely called, didn’t only transform science: it also transformed culture and psychology. Heliocentrism truly was a dangerous idea.